The market is flooded with products posing as elixirs, supplements, functional foods, and olive oil alternatives containing phenols obtained from multiple olive sources. This technically-oriented book will be of value to nutritionists and researchers in the biosciences. It unravels the body of science pertaining to olive minor constituents in relation to new chemical knowledge, technological innovations, and novel methods of recovery, parallel to toxicology, pharmacology, efficacy, doses, claims, and regulation. 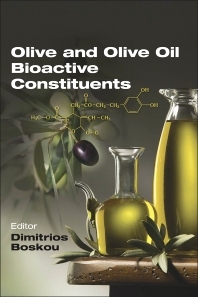 Topics include: the biological importance of bioactive compounds present in olive products; developments and innovations to preserve the level of bioactives in table olives and olive oil; and importance of variety, maturity, processing of olives, storage, debittering of olives and table olives as a valuable source of bioactive compounds. Dimitrios Boskou received his diploma and doctor’s degree in chemistry from the School of Chemistry, Aristotle University of Thessaloniki, Hellas; his Ph.D.in Food Science from the University of London; and a Doctor of Science degree from the School of Chemistry, Aristotle University. He served as an assistant lecturer, assistant professor, associate professor, professor, and head of the Laboratory of Food Chemistry and Technology, School of Chemistry, Aristotle University (1970-2006). In the period from 1986 to 1998 he was a member of the IUPAC Oils, Fats, and Derivatives Commission. He served as a member of the Supreme Chemical Council, Athens (1995-2005), and a member of the Scientific Committee for Food of the European Commission and an expert of the Food Additives Panel of the European Food Safety Authority (1995-2012).